One of the hottest trends in home décor is infusing spaces with European style. A European influence can lend an air of old-world charm and hint of sophistication than cannot be achieved by any other approach. With some thoughtful touches—furnishings, accessories, and art—you’ll have a Dining Room that evokes the feeling or sense of romance of a turn of the century chateau. Today’s modern European style with its palette of traditional colors such as cool grays, gentle beige, and light finishes gives you a look that is not too formal or stuffy, stylish but still comfortable. Warm and welcoming, yet elegant and formal, the opulent fabrics and elegant furniture combine to give rooms a European flavor. Vintage-style pieces and plush upholstery are the cornerstone of a European dining room. Neutral or earth tones add sophistication and elegance, slightly distressed finishes are also used to add a little rustic charm. 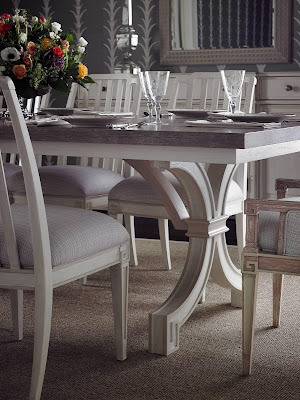 The Preserve Formal Dining Room by Stanley Furniture demonstrates this with hand-crafted paint and finishes that have just the right amount of wear-through. The side chairs and upholstered head chairs in neutral fabrics, stunning sideboard, and feature wall mirror create a formal dining room that is a feast for the eyes. The wallpaper pattern adds architectural flair to a space that was missing architectural detail and ties the look together. The hanging chandelier and lamps on the sideboard cast a warm glow about the room, making it both dazzling and serene. The simplicity and grace of the St. Helena Trestle Table features hand-painted striping and aged-looking husk top that evoke the architectural beauty of the past. The use of time-honored construction techniques and traditional shapes are central to the style and creativity at the heart of European design. Adding fresh flowers or even large tropical leaves found in your own garden lets nature and living spaces exist as one, another element often found in European design. A sophisticated dining room with European elegance is not hard to put together. Start small with accessories and souvenirs as well as carefully selected furniture pieces. Experiment until you get the look you want. Stop in to the Bear’s Furniture showroom nearest you in the Boca Raton, Naples, Sarasota, Ft. Myers, Miami, Ft. Lauderdale, Palm Beach, Melbourne, Orlando, Tampa, Florida area. Take advantage of the 500 Brands event and save up to 70%. Contact us for the most current availability on this product.